DR Congo unrest: Why are police in Kasai being decapitated? Militia fighters in the Democratic Republic of Congo have decapitated about 40 police officers in an ambush in the central province of Kasai, local officials say. The attack on a police convoy last Friday is thought to be one of the deadliest single episodes of violence in Kasai since unrest broke out in August 2016. Reports say up to 400 people have been killed in total. Six policemen who spoke the local Tshiluba language were freed in Friday's incident, but the rest were killed, Kasai Assembly President Francois Kalamba said. The Kamwina Nsapu group was believed to be behind the attack. 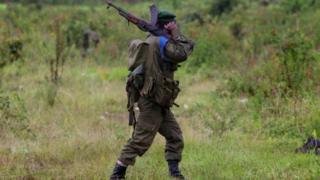 It has been fighting DR Congo forces since its leader was killed by the security forces last year. The attack came days after the UN Human Rights Council said 10 mass graves had been found in Kasai, with limbs sticking out of the soil at some of the sites. At least 99 people, including 18 children, were killed between 1 January and 23 February this year, the UN body said after a visit to the area by a team of investigators. In one attack on 10 February, government troops killed at least 40 alleged militiamen and buried them in two mass graves that its investigators had seen, the UN body added in a report. The militia is also alleged to have committed atrocities, including killing about 30 people, among them children, following an incursion into the neighbouring Lomami region on 9 March. In another instance, the militia allegedly "decapitated two policemen and took away their heads", the UN report said. What is the fighting about? Followers of Kamwina Nsapu, a traditional chief whose real name was Jean-Pierre Pandi, wanted his chiefdom to be officially recognised by the authorities. There were communal clashes after Kamwina Nsapu called for a popular uprising in June 2016 with the aim of removing all state institutions and security forces from the region. He was killed two months later when the police raided his house. His followers vowed to avenge his killing. They also demanded the exhumation of the late leader's body, saying he had not been buried in accordance with traditional rites. The conflict has since escalated, tapping into long-held grievances over marginalisation in this opposition bastion blighted by poor infrastructure. The Kamwina Nsapu fighters - largely made up of child soldiers - have targeted state institutions, looting and burning local and national government offices. However, the UN has condemned the army for using disproportionate force against fighters equipped with traditional weapons such as machetes, homemade rifles or even just sticks. The violence has now spread to neighbouring provinces, forcing tens of thousands of people to flee their homes. It is a new layer of instability in a country mired in a political crisis sparked by President Joseph Kabila's refusal to step down when his constitutional mandate expired in December. An agreement was found between the opposition and the presidential coalition on New Year's Eve which were supposed to lead to new elections. But talks, under the mediation of the Catholic Church, over its implementation have since stalled. In the meantime, a graphic seven-minute video circulated in February that appeared to show soldiers shooting civilians, including women and children, dead. They were assumed to be supporters of the Kamwina Nsapu militia. On 12 March, two UN officials - from the US and Sweden - went missing in an apparent abduction. They were investigating the alleged killing of more than 100 members and supporters of the militia by security forces in February. It is not yet clear who kidnapped them and there are growing concerns over their fate. Seven soldiers have been arrested in connection with the video and charged with war crimes. But more videos of alleged extrajudicial killings have emerged and a number of mass graves have also been discovered. The UN says that security forces have prevented its teams from accessing the sites. The authorities have pledged to investigate all allegations. Deputy Prime Minister Ramazani Shadari held talks with the family of the late traditional leader and the two sides reportedly agreed to exhume the body of Kamwina Nsapu to allow a proper burial and the installation of a new chief. A week later, about 60 militiamen surrendered to the provincial authorities. But clashes broke out near the airport in Kananga the day after and the situation remains volatile. Kasai is also a stronghold of DR Congo's main opposition party, the United People's Democratic Solidarity (UDPS). There are fears that the unrest in Kasai could take on a more political aspect. Why haven't we heard more about the violence? The attention last year was very much focused on the political impasse that reached its climax in December when President Kabila refused to step down at the end of his second term. Planned elections had not been held, which sparked civil unrest in the capital Kinshasa. The security forces crushed all demonstrations. At the time, only a few media reported the on-going clashes in the Kasai province but the scale of the violence only emerged recently as videos started to circulate on social media.